I’m not really sure how to put this, so I’m going to start off by saying I’m trying to learn how to sing with false chords to add a grit. I’ve learned throat singing (e.g. kargyraa throat singing). I also should add that I’have quite the low voice. It’s been quite a while since I’ve checked how low I can go, but I know I can with a little bit of effort get to a C2 no problem and I speak around a F2-G2. My highest chest voice note is a middle C and my highest note I am unsure of. Now for the part I’m having issues with… I can’t keep a low compression rate for the grit with my false chords. It’s either full on, or none. So if I try to sing with a grit, I’m limited in my chest voice it feels like and I’m unable to go higher than it. I also am unable to loosen the grit to make it seem less like throat singing being extended to singing. Since I’m really not sure how to put this, I’ve presented all of this information and I figured it would probably be easier for you to answer my question in this case. But, I suppose what I’m trying to ask is how can I learn to use my false chords out of my chest voice and how can I lessen the ratio at which I have the distortion at. Since I can only do full, while I want to learn to do less for singing gritty. 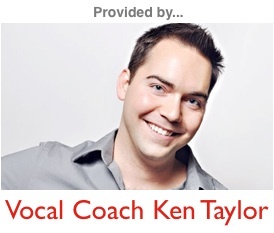 From what all you’ve said, the missing component of your voice that you need to start working on is head voice. Head voice, when done properly, is a thinner cord coordination, and uses less compression than chest voice. But, it can still be very full. In order to find balance beyond your chest voice, you’re going to have to find balance in your head voice. I suggest practicing on goo, gee, woo, or wees. Start at the top so that you absolutely can’t take up more pressure, and come down. Make sure that your larynx is balanced or lowered, and that the shape in the back of the mouth is narrow. If you find it wanting to grip, work on the woos or wees, and start this sound with air. This will take away your desire to use too much compression (though can have a medium amount of compression if you feel the “W” buzz on your front lips). I hope this makes sense. Once you find a bloomier shape and sound in head voice that’s full, but relaxed (within the qualifiers I mentioned above), you can use that coordination as the foundation of your mix. I know this is technical, but it sounds like you’re pretty knowledgable, so I decided I answer accordingly. If you have any questions, or would like to set up a skype session so that I can hear more specifically what your voice is presently doing, feel free to reply to the email that sent you here. I hope this helps, and best of luck along your vocal journey!